Ultimate Bet is proud to be the home of 11-time WSOP bracelet winner Phil Hellmuth and poker pro Annie Duke. If you have ever dreamt of playing against them – this is the place for you. 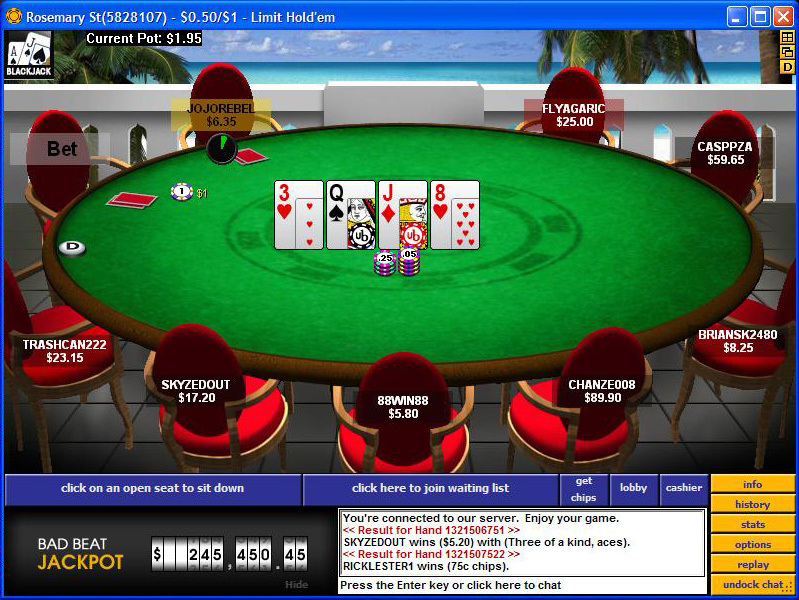 Here you will find all your favorite poker games and other great card games. Among the poker games are: Texas Hold'em, Omaha, Razz, 7 Card Stud, Omaha Hi-Lo, H.O.R.S.E, H.O.S.E. Besides the poker games, there is a also a variety of other card games such as Pineapple, Blackjack & Elimination Blackjack and even the game you used to play as a child, which you can now play for real money – Rock, Paper, Scissors! The stakes range from $0.02/$0.04 up to $500/$1000. As for the difficulty range, at the low table stakes you will encounter easy players, but as you progress to the high stakes tables, the competition will become tougher and more challenging as the cash gets bigger. There are tables of 9 players, tables of 6 players and the Heads-Up tables that allow you to play against one other opponent. Deposit Options: Visa, MasterCard, ukash, Click2Pay, ClickandBuy, Bank Wire, check by mail, Moneybookers, Paysafe Card, Neteller, U.K. Debit Cards. Withdrawal Options: Visa, MasterCard, ukash, Click2Pay, ClickandBuy, Bank Wire, check by mail, Moneybookers, Paysafe Card, Neteller, U.K. Debit Cards. Support is available by e-mail. Questions are answered and problems are solved quickly and in a professional manner. You will find here various tournament and Sit-N-Go games of all kinds. There are games for 27, 36, 45, 90 and 180 players, so you can choose how crowded you want your game to be. But not to worry, there are also small games here for 6, 8, or 9 players and the traditional Heads-Up table as well. Tournaments buy-in range from free tournaments, where 30 places or more get paid, to entrance by points you earn, and up to entering the tournaments by cash ($1.10-$1,500). There is a wide range of Freeroll tournaments, where prize pool range from $50 up to a special $1000 tournament for new depositors, in which 63 players get paid! Other tournaments pay well too, as you will find tournaments of prize pool of $1,000, $3,000, $15,000 and even $100,000, where 36 players get paid! If you want to participate in the big tournaments, but currently can't afford the buy-in, try one of the many satellite tourneys. Enter a Satellite for $1.10 only and win an entry into $2,000, $3,000, $5,000 and even $200,000 tournaments. 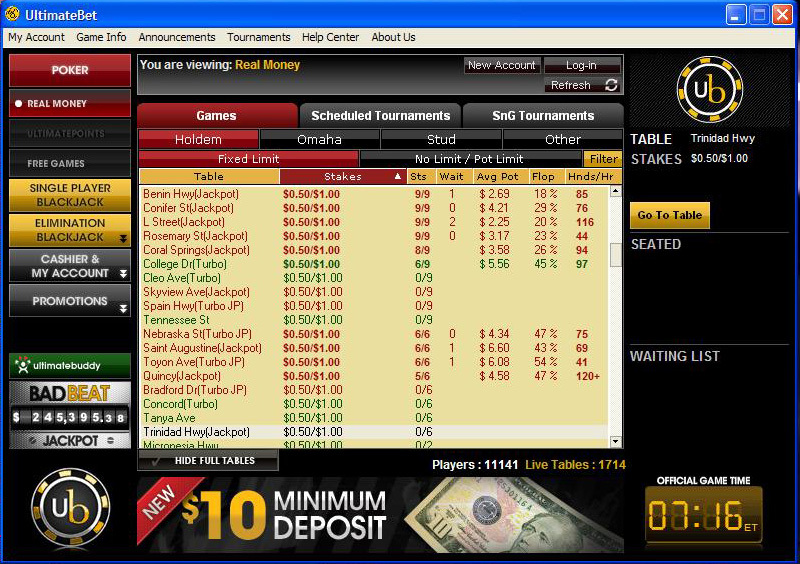 You will also find here Multi-Table Tournaments that reward you with a lot of money as you progress upward through the ranks. Another way of winning big cash is playing the Bounty Tournaments, where aside from the tournament's prizes, you also earn money for each player you eliminate from the tournament. Ultimate Bet gives the opportunity to win a seat at the world's biggest poker events as well, so take a seat at one of the tournaments that offer you a package to the WPT and the WSOP. Ultimate Bet spoils you with great and special bonuses never seen anywhere before. At Ultimate Bet, you get 111% of your deposit up to $1,100! - Ultimate Bet has a rewarding point system, so the more the play, the more points you earn and can use them by entering various tournaments with prize money or use them to treat yourself to different cool merchandise from the store. - Ultimate Bet also has a special Bad Beat Jackpot for you, so if you find yourself losing a monster hand, you will actually win a whole lot of money - more than $100,000! - Another great feature is the option to win a seat at the WSOP tournament for just 10 cents! All you have to do is pass through 10 steps in the Step Tournaments and you can win a $10,000 Main Event seat and $2,000 for travel and accommodations - all that for 10 cents only! - There are also the special GizmoRoll: WoW tournaments, where you can win gifts and other hot gadgets such as: World of Warcraft Computer + 6 months of game time, Samsung Sync Master 24 Inch LCD, Nintendo DS, Ultimate Bet T-Shirt and more. The entrance to these tournaments is paid with your points, which saves you some money while giving you these incredible prizes. - There are also SNG and Multi-Table-Tournaments Leaderboards, where you have 3 different divisions to play in and win great prizes, including cash. - If that's not enough for you and you enjoy playing for free but not sure yet about playing for cash, you can turn your play money into real money. Once you hold 10 Million Play Chips, you will be awarded $50 in real cash! So now you have the chance to practice in play money and later on storm the real money tables to enrich your bankroll with no fear at all. - The last great special feature is the way you can use your ultimate points. One option is to turn them into real cash. Another option is to use these points in the Ultimate Bet store to purchase a new 46 Inch T.V, an Apple iPod, T-Shirts, Jewelry and other items. You can also use them to enter various tournaments and win prizes and cash, but maybe the most interesting option is using your points in the Ultimate Auctions. Here you can bid for different great merchandise using your points and win your desired gift for free. Anniversary Gifts By Year is a brand new gift ideas website for married couples. Looking for the perfect gift for your wedding anniversary? You can find all of them here, from jewelry and cosmetics to gadgets and sports items.